Mother's Day is not an invention by greeting card or flower shops! The origins go back to the 1600s in the UK. 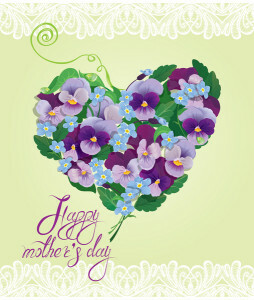 Today Mother’s Day or Mothering Sunday is celebrated all over the world. For florists and card shops the event is one of the highlights of the year, but the roots of Mother’s Day are not commercial. Motherhood has been celebrated since ancient times. The ancient Greeks paid homage to Rhea, the Mother of Gods; and there are records of the ancient Romans worshiping a mother Goddess known as Cybele as early as 260 BC. Festivals took place in the spring which was the most fertile time of the year. The more modern way of honoring mothers began in England in the 1600s where Mothering Sunday was observed on the fourth Sunday of Lent. This day is also known as ‘Refreshment Sunday’, the only day when you are allowed to eat or do whatever you have given up for Lent. Not surprisingly, families came together and took the opportunity to party with a big meal at which mother was treated as the guest of honor. Traditionally, mothers were given posies of flowers and a cake. The term ‘Mothering Sunday’ is now falling into disuse and has mostly been replaced by ‘Mother’s Day’, which is used the world over. In the USA there were several attempts to introduce a Mother’s Day as a way to celebrate peace and heal the scars of war. Julia Ward, who wrote the words to the Battle Hymn of the Republic, suggested the idea in 1872. But the idea didn’t really take off until Anna Jarvis campaigned for the establishment of a Mother’s Day to commemorate her own mother who died in 1905. Ward’s mother herself had tried to establish a similar holiday, Mother’s Friendship Day, to heal the pain of the Civil War. The first Mother’s Day in the USA was held in 1907 when Julia Ward held a ceremony to honor her mother. She then successfully campaigned for a formal holiday to honor mothers and by 1911 most states had taken up the idea. This was followed in 1914 by a declaration by President Woodrow Wilson that Mother’s Day should be celebrated as a national holiday on the second Sunday in May. The idea quickly spread to Canada and Mexico and many more countries throughout the world. The commercialization of Mother’s Day quickly followed, much to the disgust of Anna Jarvis who was arrested in 1923 at a Mother’s Day festival for trying to stop women selling flowers. Jarvis said “I wanted it to be a day of sentiment not profit. Ironically Anna Jarvis campaigned for many years against the commercialization of Mother’s Day, the day she had worked so hard to establish. Although she had no children of her own, each Mother’s Day Anna received hundreds of cards from all over the world. Anna Jarvis died in 1948.